A sector is a specifically sized division of a hard disk drive, optical disc, floppy disk, flash drive, or other kind of storage medium. A sector may also be referred to as a disk sector or, less commonly, a block. What Do Different Sector Sizes Mean? Every sector takes up a physical location on the storage device and is usually made up of three parts: the sector header, the error-correcting code (ECC), and the area that actually stores the data. Usually, one sector of a hard disk drive or floppy disk can hold 512 bytes of information. This standard was established in 1956. In the 1970s, larger sizes such as 1024 and 2048 bytes were introduced to accommodate larger storage capacities. One sector of an optical disc can usually hold 2048 bytes. In 2007, manufacturers began using Advanced Format hard drives that store up to 4096 bytes per sector in an effort to both increase the sector size as well as improve error correcting. This standard has been used since 2011 as the new sector size for modern hard drives. This difference in sector size doesn't necessarily imply anything about the difference in possible sizes between hard drives and optical discs. Usually, it's the number of sectors available on the drive or disc that determines capacity. When formatting a hard drive, whether using Windows' basic tools or via a free disk partitioning tool, you're able to define a custom allocation unit size (AUS). This is essentially telling the file system what the smallest portion of the disk that can be used to store data is. For example, in Windows, you can choose to format a hard drive in any of the following sizes: 512, 1024, 2048, 4096, or 8192 bytes, or 16, 32, or 64 kilobytes. Let's say you have a 1 MB (1,000,000 byte) document file. You can store this document on something like a floppy disk that stores 512 bytes of information in each sector, or on a hard drive that has 4096 bytes per sector. It really doesn't matter how large each sector is, but only how large the entire device is. The only difference between the device whose allocation size is 512 bytes, and the one that's 4096 bytes (or 1024, 2048, etc. ), is that the 1 MB file must be spanned across more disk sectors than it would on the 4096 device. This is because 512 is smaller than 4096, meaning less "pieces" of the file can exist in each sector. In this example, if the 1 MB document is edited and now becomes a 5 MB file, that's an increase in size of 4 MB. If the file is stored on the drive using the 512-byte allocation unit size, pieces of that 4 MB file will be spread across the hard drive into other sectors, possibly in sectors further away from the original group of sectors that hold the first 1 MB, causing something called fragmentation. However, using the same example as before but with the 4096-byte allocation unit size, less areas of the disk will hold the 4 MB of data (because each block size is larger), thus creating a cluster of sectors that are closer together, minimizing the likelihood that fragmentation will occur. In other words, a larger AUS generally means files are more likely to stay closer together on the hard drive, which in turn will result in quicker disk access and better overall computer performance. Windows XP and newer Windows operating systems can run the fsutil command to see the cluster size of an existing hard drive. For example, entering fsutil fsinfo ntfsinfo c: into a command-line tool like Command Prompt will find the cluster size of the C: drive. It's not very common to change the default allocation unit size of a drive. Microsoft has these tables that shows the default cluster sizes for the NTFS, FAT, and exFAT file systems in different versions of Windows. For example, the default AUS is 4 KB (4096 bytes) for most hard drives formatted with NTFS. If you do want to change the data cluster size for a disk, it can be done in Windows when formatting a hard drive but disk management programs from 3rd party developers can do it too. Though it's probably easiest to use the formatting tool that's built-in to Windows, this list of Free Disk Partitioning Tools includes several free programs that can do the same thing. Most offer more unit size options than Windows does. 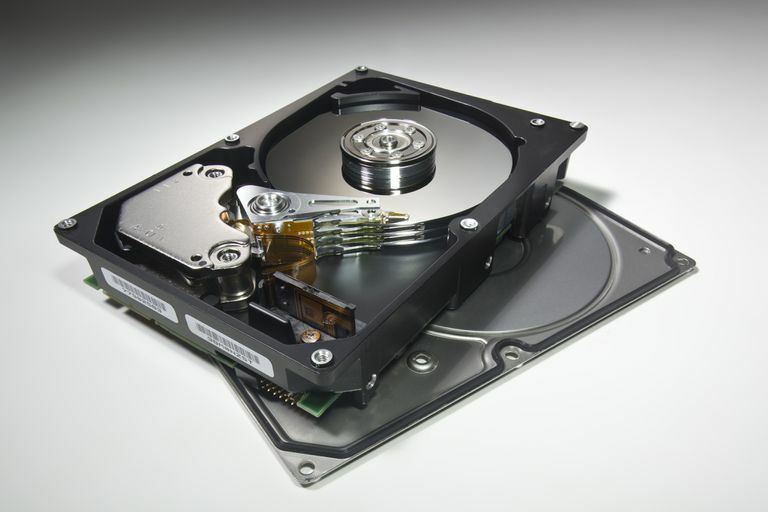 A physically damaged hard drive often means physically damaged sectors on the hard drive platter although corruption and other sorts of damage can happen too. One particularly frustrating sector to have issues is the boot sector. When this sector has issues, it renders the operating system unable to boot! Although a disk's sectors can become damaged, it's often possible to repair them with nothing more than a software program. See How Do I Test My Hard Drive for Problems? for more information on programs that can identify, and often correct or mark-as-bad, disk sectors that have issues. You may need to get a new hard drive if there are too many bad sectors. See How Do I Replace a Hard Drive? for help replacing hard drives in different kinds of computers. Just because you have a slow computer or even a hard drive that's making noise, it doesn't necessarily mean there's something physically wrong with the sectors on the disk. If you still think something's wrong with a hard drive even after running hard drive tests, consider scanning your computer for viruses or following other troubleshooting. The sectors that are located near the outside of a disk are stronger than those that are closer to the center, but also have a lower bit density. Because of this, something called zone bit recording is used by hard drives. Zone bit recording divides the disk into different zones, where each zone is then divided into sectors. The result is that the outer portion of a disk will have more sectors, and thus can be accessed quicker than the zones located near the center of the disk. Defragmentation tools, even free defrag software, can take advantage of zone bit recording by moving commonly accessed files to the outer portion of the disk for quicker access. This leaves data that you use less often, like large archive or video files, to be stored in zones that are located near the center of the drive. The idea is to store data that you use least frequently in areas of the drive that take longer to access. More information on zone recording and the structure of hard disk sectors can be found at DEW Associates Corporation. NTFS.com has a great resource for advanced reading on the different parts of a hard drive, like the tracks, sectors, and clusters.